Barefoot Willies was founded in 1999 by Bill "Barefoot Willie" Fowler in a tiny town in Kansas that you probably haven't heard of. 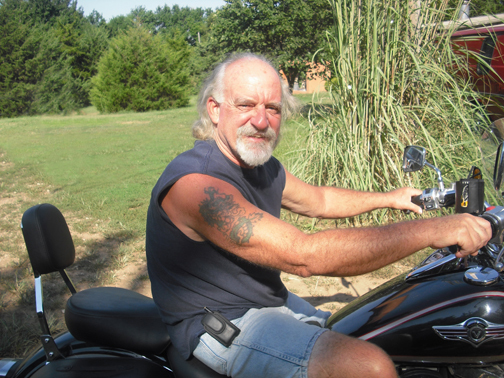 His love for motorcycles and finding solutions for everyday riders led him to design and produce the original handlebar mounted beverage holder the "Cool Rider" as well as several other innovative and clever accessories. Bill is retired now but you can still catch him puttin' around the highways and byways of central Kansas. Barefoot Willies is now run by Bill's two nephews, Mark and Brian and is located just outside of Baltimore, Maryland. Bobrow Brothers, LLC is the parent company of Barefoot Willies Motorcycle Accessories. It is the company formed by Mark and Brian in 2008 in an effort to "stop working for the man" and to start making a living working for themselves. The original business was (and still is) a canvas and photo printing venture called Canvas Brothers. Mark had been in and out of the printing and graphics design world for several years and Brian had been in the ministry. Both of the brothers found themselves ready for new opportunities at the end of 2008 and bought the equipment for the printing company with some funding from their very generous mother (Bill's sister). Working the canvas print shop taught the brothers a ton about business, the internet and marketing. Mark and Brian ran the print shop for a couple years and became interested in expanding into other areas. They began a conversation with their Uncle Bill that would lead to the brothers taking over the Barefoot Willies website and marketing. A year or so went by before Bill, Mark and Brian would draw up an agreement for the business to change hands in its entirety to the nephews and allow Bill to retire and pursue other interests. A note from Mark- The past several years have been so amazing! I feel so blessed and lucky to be able to work here with my brother and for us to be doing it for ourselves! This business has taught me so much and I continue to learn everyday. I am grateful for our many many satisfied customers and I'm so happy to occasionally hear from them about how much they enjoy our products. I get to work daily with folks from all over the country and beyond that are excited and passionate about motorcycles and the motorcycle community. It is my goal to mirror that passion in the conduct of this business and to provide outstanding and tailored customer service for all of our customers, from the largest of online retailers to the individual just looking for a few screws that he may have misplaced. Brian and I are excited to continue to serve and to keep innovating just like Uncle Bill. Cheers!